Bend/Redmond tops the U.S. Metro list of fastest job growth in 2015. Erik Siemers, managing editor of the Portland Business Journal. The U.S. Conference of Mayors last week released a new economic report showing how the country’s cities and metro areas are driving economic growth. In particular, the study showed that metro areas accounted for 96.5 percent of all new U.S. Jobs last year — the highest mark in 16 years. 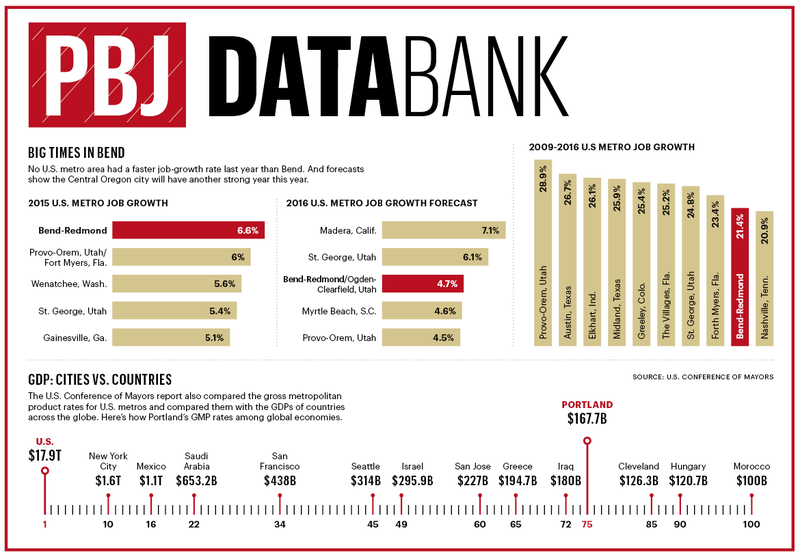 As the Business Journal highlights the region’s biggest employers in this week’s print edition, the graphic below takes a look at some of the most interesting data from the USCM report.